He remembers the building crashing down all around him but not how he got in a hostel in the middle of Amsterdam. He now awakes with only pictures, poetry and postcolonial questions and sounds to help him figure out what happened and where he needs to go. THE BEARABLE ORDEAL OF THE COLLAPSE OF CERTAINTIES fuses poetry with music and location based theater to bring a fresh way of looking at Dutch colonial history and its legacy. It’s about the past and the way it still lives on in the present through us. It’s about embracing spaces where nothing is certain anymore. It’s about love and loving without judgment. As the story jumps from topic to topic, connected through the associative mind of an inquisitive twentysomething Dutch Antillian, a vast landscape of intertwined fates becomes visible. With the current political climate in the Netherlands this play seeks to understand how it got so far and what can be done to turn the tide of xenophobia and populism wreaking havoc on society today. 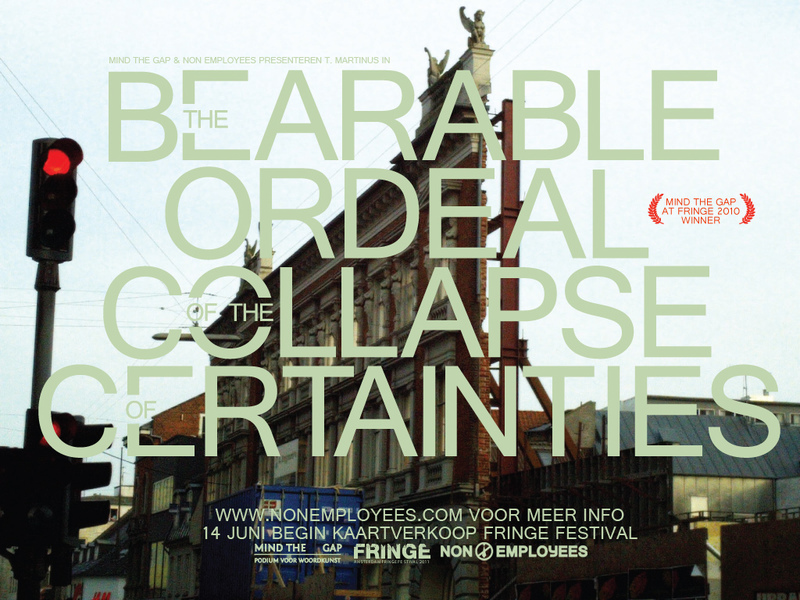 In 2010 heeft T. Martinus ‘Mind The Gap @ Fringe Festival’ gewonnen en daarmee en plek in Amsterdam Fringe Festival 2011 gekregen. Die won hij met een monoloog dat aan de basis stond van deze nieuwe voorstelling. Coaching & direction by Camie Bongers. Presented by Mind The Gap, Fringe Festival and Non Employees. Supported by Stay Okay Zeeburg and Nowhere.